Imagine that the recording process had been invented at the end of the 18th century and we had recordings of Beethoven, Brahms and Mahler conducting their own works. What documents they would be (with Mahler it almost could have happened; there are a few piano rolls). Maybe not the last word, but certainly an invaluable first word. 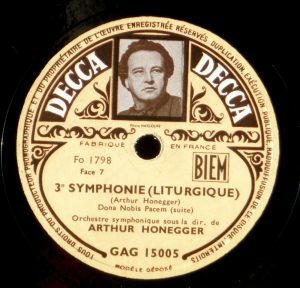 That said, hearing Arthur Honegger conduct his own works (recordings made in 1929-30 and, in the case of the Symphonie “Liturgique”, circa 1947/8), the composer sometimes has unique insights on his own compositions… and sometimes not. In the case of Pacific 231 and Rugby (recorded “1929” according to Music & Arts and various other sources, but 13 February 1930 in the competing 2006 Dutton reissue, CDBP 9764), naturally the antique sonics can make these versions no more than documents: Honegger’s dense and intricate orchestration calls for modern stereo, and it is only with Bernstein‘s 1962 recording that everything could be heard for the first time (paired with Milhaud: Les Choéphores and Roussel: Symphony No. 3 on Sony Masterworks Heritage MHK 62352 or on Bernstein Century: French Masterpieces, Sony SMK 60695). Still, in the case of Pacific, the conductor brings out unique touches from his own composition, that have never been emulated in the dozen of subsequent recordings that I’ve heard. Nobody like Honegger has the opening sforzando string harmonics phrased with such a sharp bite. Very few (Tzipine in 1953, now on Les Rarissimes de Arthur Honegger) have the stopped trumpets’ staccato accompaniment figure at 2:25 (measure 109 and following) played with such a nasty snarl. And the piccolo flutes at 2:36 are piercing. But, other than those details, there is one thing that Honegger shares with his predecessor Piero Coppola who had made the premiere recording in 1927 (on Dante’s Piero Coppola Collection Vol. 3 – La Musique Française XXe Siècle, Dante Lys 373, published in 1998), and that no subsequent version has quite recaptured: propulsion. By his own description the locomotive that Honegger had in mind (describing in musical form not so much its actual sounds, as the physical impression conveyed by the machine) was a “heavy-weight, high-speed” engine, and he also talks of the “lyrical state, the pathos of the 300-ton train hurled in the middle of the night at 120 kilometers an hour” (yeah, in 1921, that was fast). Later versions concentrated more on the weight and on bringing out all the details of the orchestration. They all emphasize, for instance, the machine’s slow rolling into motion – but not Honegger, with him the energy is more powerful than the forces of gravity. Typically, Coppola and Honegger completed their ride in, respectively, 5:54 and 5:56. No subsequent version that I’ve heard made it under 6:00 (Bernstein), and none more acutely than Coppola and Honegger made Pacific sound so close to Mossolov’s Iron Foundries or the final Danse Sacrale from Stravinsky’s Rite of Spring. You won’t hear it without a score (and even with one you’re likely to think it was your attention that lapsed for a second, because it is cleanly done) but Music & Arts added a bar of music when they spliced the 78s side joint at 3:27 – obviously side B repeated the final bar of side A. Dutton’s transfer botches the splice even more. Despite all the imperfections of the instrumental performance (with in particular a tuba way out of its depth – literally – at 4:46) and lack of precision in orchestral playing, the same dynamic propulsion is at play in Honegger’s conducting of Rugby – although, here, Scherchen in 1954 displayed even more (on Westminster’s “Honegger: Pacific 231/ Stravinsky: Petrouchka”). On the other hand, the one striking thing about Honegger’s self-conducted Pastorale d’été (recorded 6 December 1930 according to Dutton), is how bad and unatmospheric it is. It’s not just that this atmospheric music is played by an orchestra undistinguished in ensemble and in tonal production: it is how, taken at a pressing tempo (the one indicated in the score… Honegger the conductor is here very observant of Honegger the composer), rhythmically square it sounds, never letting you forget the underlying sense of a 1-2-3-4 beat given by the underpinning cellos. Sometimes composers know better… and sometimes they don’t seem to be aware of what they composed. Honegger’s offering of The Prelude to the Tempest (composed in 1923) isn’t very good either. Music & Arts says 1929, Dutton didn’t give a recording date for this one, but the entry under worldcat dot org indicates a publication in 1931, 78rpm Odeon 238.261 – matrix KI 3936 and KI 3937. Even if the orchestra had had the virtuosity to play it truly tempestuously, the congested sonics could not have offered much more than the impression of watching a storm on a black and white movie screen. To LIVE a furiously tempestuous storm, mono notwithstanding, one had to wait for Scherchen‘s extraordinary recording in 1954 (see link above), which nobody since has emulated, whatever the added impact of stereo. I haven’t done the same kind of comparison with the two short excerpts – the Overture and Ballet – from Honegger’s operetta from 1930 “The Adventures of King Pausole” – this is the lighter side of the composer. Recording given as 1930 and online research indicates 31 December 1930. Here as on Dutton the reissue is frustrating because there were three original 78rpms on the label Odeon, one collated here with the Overture and a ballet and two with Arias sung by the premiere performer Dorville and Gabrielle Gills (and the “Odeon Operetta Orchestra”), not included. As already mentioned, these recordings were also reissued by others, the main overlaps being with Dutton, but also the French Alpha if you add Symphonie Liturgique in the picture (Alpha 802, released in 2008). Sources and, of course, transfers are not the same: Dutton used chiefly English Parlophone 78s rather than the original French Odeon; Alpha uses the sources kept in the music library of the French public radio, e.g., for Rugby and Pacific, the original Odeon 78s. The sources of Music & Arts are more varied: French Odeon for Pastorale d’été and Pausole, English Odeon (they say, but it is the same label number as the French Odeon issue) for the Tempest-Prelude, American Columbia for Pacific and Rugby. Dutton’s transfers usually has more highs and sound brighter, but they also come with the kind of dessicated background that points to excessive filtering, particularly disagreeable in Pastorale d’été, and to a lesser extent in Pausole: I much prefer the 78s surface noise of Music & Arts, and it is not the added brightness of Dutton that makes such a huge compensating difference – this will never be high fidelity anyway. The transfers of Alpha have less surface noise and scratches than Music and Arts’, but sound more muffled. Alpha is only the only one of the three that gets the side joint of Pacific right. But it is that by which the three reissues differ that is really going to be the discriminating factor. Dutton has the beautiful Cello Concerto, played by its commissioner and dedicatee Maurice Maréchal under the conductor in 1943, sounding much better than the rest and a fine interpretation (and one of the rare recordings too to offer the ad libitum cadenza written by Maréchal – most performances inexplicably leave out any cadenza altogether, Maréchal’s should be mandatory). The rest of Dutton is filled by works by Maurice Jaubert and Gabriel Pierné, conducted by their respective conductor. 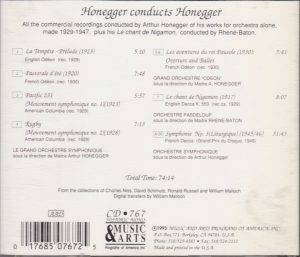 But not only is Music & Arts all-Honegger program more coherent, it is also very substantial, offering not only Honegger’s rarely recorded early tone poem Le Chant de Nigamon (conducted in 1929 not by the composer but by Rhené-Bâton) but the composer’s own recording of his Third Symphony “Liturgique“, from circa 1947-1948, originally on French Decca 78rpm GAG 15004-7 (it was awarded the French Grand Prix du Disque in 1949, but the great Honegger biographer Harry Halbreich, so detailed in his survey of Honegger’s daily or monthly life, is curiously silent about it). Alpha also has the same Third Symphony, but its complements are 78s recordings of miscellaneous Honegger songs performed by himself and singers closely associated to him, like Claire Croiza: attractive, but less coherent than Music & Arts all-orchestral program. Le Chant de Nigamon, from the novel of Gustave Aimard’s Le Souriquet (1882), is the Iroquois chief who was burnt at the stake and scalped (in that order) by his victorious Huron enemy Terah, and still manages to chant after that. Honegger’s music starts where the most tempestuous Debussy of Pelleas or La Mer ends, and evokes memories of Schmitt’s Tragédie de Salome and Dukas’ Sorcerer’s Apprentice. Looking at Rhené-Bâton’s overall timing of 8:05 and comparing it with Munch’s – no Klempererian slouch! – of 9:45, live with Orchestra National in 1962 on Disques Montaigne MUN 2051, I expected the 78s version to have exercised cuts – back in 1929 it wouldn’t have been surprising. There are no cuts. You hear what you can of Honegger’s dense orchestration (and none of the percussion), but Rhené-Bâton conducts a version of remarkable urgency if no great subtlety, and the Pasdeloup orchestra is formidably responsive. Honegger’s recording of “Liturgique” is a touching testimony also because the composer announces the title of each movement (there were others, and more substantial interviews of the composer in the early LP era, none reissued on CD). The composer conducts with a sure hand and the unnamed orchestra (I’ve read but can’t locate anymore some French sources claiming it was Belgian) is responsive, playing with great vehemence in the violent first movement, “Dies Irae”, and the required bite and nastiness in the implacable and ominous march of the Finale (“…the relentless progress towards the slavery of man… the rise of collective stupidity… the march of the robots against civilized man, holder of a body and a soul… The revenge of the beast against the spirit… the imbecile march of a long flock of mechanical geese waddling in rhythm”…). But the copy used by Music & Arts was so worn and scratchy as to make the sonics sound easily 20 years older than their circa 1947 vintage, robbing the music of much of its impact, and making this little more than, not even a document, but a documentation. Alpha had a better copy or (and) filtered it more, almost eliminating all traces of LP surface noise, but the result is more muffled in sound, although it still makes a slightly more comfortable listening experience. It is interesting to note a bass drum thwack at 3:43 in the Finale that is not indicated in the study score – but, except for Mravinsky, Jansons and Fabio Luisi, everybody plays it, although as a muffled and almost indistinct thud rather than the dry and resounding thwack of Honegger, much more effective. 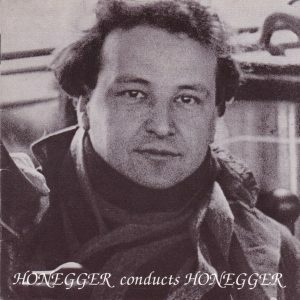 Another interesting observation is how usually inobservant Honegger the interpreter is of the composer’s metronome indications – he’s at the lower end of his 70-80 half-notes per minute in the first movement, but significantly above his 88 quarter-notes for the implacable and ominous march of the Finale, closer to 100 (in his biography Harry Halbreich mentions that in an unpublished manuscript interpretive note, Honegger suggested a tempo of 112). And when comes the conclusive Adagio, at 7:16, he is at circa 35 quarter-notes/mn, WAY below his indicated 58. No complaint here, the musical result is beautiful. But I find that the interpreter does shoot the composer in the foot by adopting again a very deliberate and pedestrian tempo in the slow movement, about ten beats under his own metronome mark of 54 quarter-notes. I find the slow movement one of the weakest inspirations of Honegger – he himself, quoted in the liner notes, said it had given him much trouble, trying as he was to develop a melodic line without using the customary methods and formulas, one that would “go forward without looking back“, extending “the intial curve without repetition or stops“. But where Mahler masterfully succeeded, especially in his 9th symphony (and I’m bringing up Mahler because, as laid out on the score, Honegger’s orchestration is very evocative of Mahler’s), to my ears Honegger fails, because his material and moods sound naïve and tritely pastoral in the manner of the Christmas Cantata (“how hard it is to put a prayer without hope into human mouths“), making the movement seem overlong and somewhat diffuse. But the interpreter’s sluggish pacing makes it even more naïve and overlong, added to the fact that, kept at the same sluggish tempo, the climax that develops from 5:19 to circa 7:40 is bleeded of its tension and hardly registers. That said, Karajan (on DG 20th Century Classics 423 242-2 or DG “The Originals” 447 435-2), at an even slower tempo, brought it off beautifully in 1969; but the sonics made a major difference in the impact it conveyed. Anyway, whatever the sonic and interpretive limitations of these recordings, as a documentation of the composer conducting his own works this is the disc to prefer over the Dutton reissue or the one on Pearl, “Honegger and Milhaud, Conduct Their Own Music” (GEMM CD 9459, 1993, barcode 727031945925), less complete as Honegger shares the bill with Milhaud. It is however a hard choice with the Alpha CD: price will be a deciding consideration, and sonically it is a trade-off between clarity and surface noise, but the loss of Chant de Nigamon and Prelude to the Tempest would be regrettable. At any rate the Cello Concerto with Maréchal deserves not to be missed, but it can be found on an EMI reissue, in their “Composer in Person” series, EMI 5 55036 2, barcode 724355503626, paired with recordings by Poulenc, and in transfers that seem more acurately pitched than Dutton’s. And here’s a final treat: on YouTube, the 1949 documentary by Jean Mitry, based on Honegger’s composition and using the composer’s very recording, that was awarded the prize for best edit at the 1949 Cannes Festival (for the impatient, the music starts at 2:40). The documentary has captured something of the speed and excitement so integral to the composition, the fascination for machines and mechanisms that was at play in similar compositions of Prokofiev, Mossolov, Antheil, Converse (see on Amazon.com my review of Louisville First Edition Encores- Arthur Bird: Eine Carneval, Scene for orchestra / Frederick Shepherd Converse: Endymion’s Narrative / Flivver Ten Million) or the paintings of Fernand Léger and the photographic work of Lewis Hine.